Oregon Quality Rating and Improvement System (QRIS) is a program that raises the quality and consistency of child care and early learning programs across the state. The Quality Rating System recognizes, rewards and builds on what early learning and development programs are already doing well. It helps ensure children in QRIS programs are ready for kindergarten by connecting programs and providers with free tools, financial incentives and professional advice that they can put into practice with confidence. The foundation of the QRIS process is continuously improving the quality of your program for the families and children you serve. QRIS participants understand that even if they were to achieve the highest rating, their goals of increasing quality don't end there. Oregon’s has a unique and rich early learning landscape. The development of Oregon’s QRIS was guided by national standards and customized to recognize quality practices in Oregon’s formalized early learning and development programs. Click here for Oregon's QRIS Histoy infographic! Oregon's QRIS Data Facts is a monthly infographic report that highlights the progress of Oregon's QRIS during its field test period. The Data Facts showcase how many children are in QRIS programs, how many programs are participating, how many programs are star-rated, and feedback from around the state. Click here to view the library of Data Facts! 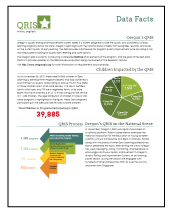 Oregon's QRIS newsletter is a resource with beneficial information for all programs, families and early learning professionals. This quarterly newsletter offers articles covering topics such as program highlights around the state, tips to understanding the QRIS, and upcoming events. Sign up below to receive this newsletter!